A PICC line, or Percutaneously Inserted Central Catheter, is a medical device that is placed into a vein to allow access to the bloodstream. Pronounced “pick”, the line is a type of vascular access device that allows fluids and medications to be given to a patient. Like a standard IV, a PICC line allows the medication to be infused into the bloodstream, but the PICC is more reliable and more durable. It can also be used to give larger volumes of fluids and medications that are too irritating to the tissue to be given through a standard IV. A PICC line is used for a variety of purposes, typically in patients who are expected to need IV medication for several weeks or more. A PICC can remain in place for months as long as infection does not occur at the site of the line. A PICC may be used when a patient is a “hard stick” and the healthcare team cannot place an IV despite repeated attempts. It may also be used to protect the blood vessels from medications that are caustic and could potentially harm the skin around an IV site, or cause damage to blood vessels, such as chemotherapy. 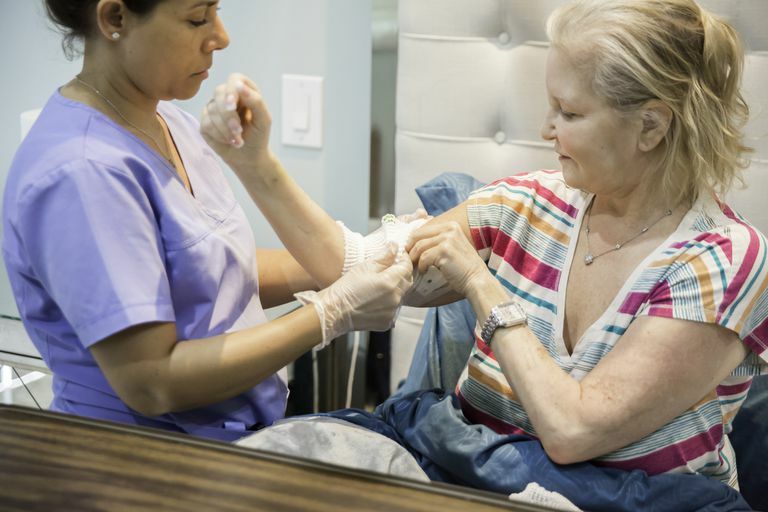 A PICC line is also used to prevent the patient from being stuck repeatedly, for example, certain kinds of infections require daily IV antibiotics for 6 weeks or more. A PICC line can be placed and if no complications arise, can remain in place for the full six weeks of treatment. Most facilities only allow a standard IV to remain in place 3-4 days before it is removed and a new one placed, over the course of many weeks the PICC can substantially reduce the number of times a patient has to tolerate an IV being placed. PICC lines can also be used to draw blood. Patients who are difficult to draw blood from, or do not tolerate blood draws well, may have a PICC to spare them daily (or more) pokes of a needle. PICC lines can also be used for multiple medications at one time. If two medications are not compatible and need to be given at the same time, two IV sites are necessary. A PICC line can have multiple ports, allowing incompatible medications to be given in different ports. Although they are both going into the PICC line, the medications are not mixing in the PICC line and enter the bloodstream at different points, which allows them both to be given at the same time through one site. PICC lines are typically placed by nurses (RN), physician assistants (PA) or Nurse Practitioners (NP). The procedure is typically done at the bedside if the patient is in the hospital, or as an outpatient procedure for other individuals. The PICC line itself is a long tube with a guide wire inside to stiffen the tube to make it easier to thread into the vein. A vein is selected, and the PICC line may be trimmed to a shorter length if necessary, especially if the patient is petite. The ideal length allows the line to extend from the insertion site to where the tip rests in a blood vessel outside the heart. The insertion site is typically numbed with an injection. The area is cleaned thoroughly and a small incision is made to access the vein, typically in the arm. Using sterile technique, the PICC line is gently inserted into the vessel. It is slowly and gently advanced into the blood vessel, where it goes up the arm and then makes its way toward the heart. In many cases, an ultrasound machine is used to identify the best site for PICC placement, which can reduce the number of times a patient is "stuck" while placing the line. Once the PICC is in the appropriate place, it can be secured to the skin outside of the insertion site. Most PICC lines are sutured in place, meaning that the tubing and port that rests outside of the skin is held in place by stitches. This prevents the PICC from being removed accidentally or moving toward the heart. Once the PICC is in place, an x-ray is performed to determine if the line is in the appropriate place in the blood vessel. If it is not in the appropriate place, it may be pushed further into the body or pulled back slightly. Once placement is confirmed the guide wire is removed and the line is safe to use. Removal of a PICC line is quick and typically painless. The sutures holding the line in the appropriate place are removed, and the line is gently pulled from the arm. Most patients say that it feels strange to have it removed, but it is not uncomfortable or painful. Once the PICC is out, the end of the line, which was inside the patient, is inspected. It should look the same as it did when it was inserted, with no missing pieces that could potentially be left inside the body. A small bandage may be placed over the site if there is bleeding present that will remain in place 2 or 3 days while the wound heals. Infection: An infection may form at the insertion site, an event that is more likely the longer the PICC line remains in place. Blood Clot: Blood clots can form on the tip of the PICC line, if these clots break free they can travel through the heart to the lung, a condition called a Pulmonary Embolism (PE). They can also form in the arm around the line. Malfunction: PICC lines can become clogged. Medications are available to try to clear the line, but is not always effective and may result in the removal of the line. Irritation of the Heart: If the line is too close to the heart, or in the heart, it can irritate the heart and cause problems with the rhythm of the heart. If the problem is not diagnosed quickly, the PICC line rubbing against the constant movement of the heart can cause damage to the heart muscle or valves. PICC lines require regular maintenance, including routine sterile dressing changes, flushing with sterile fluid and cleaning of the ports. Many patients cover their PICC site with plastic wrap or a waterproof bandage for showering. You should not get your PICC site wet, so submerging your arm in a bath or swimming is not advised. Preventing infection is key, which means keeping the site clean, keeping the bandage in good condition, and washing your hands prior to touching the ports. Peripherally Inserted Central Catheter Dressing Change. Medline Plus.